Series B of Ensemble Studio Theatre’s Marathon of One-Act plays begins in a US government-funded lab for scientific research on climate change in Oymyakon, Siberia with Emma Goidel’s We Can All Agree To Pretend This Never Happened, directed by Abigail Zealey Bess. Essentially a light farce, the intrigue revolves around the ulterior plan of head scientist Liz (Polly Lee) in order to really draw the world’s attention to the dangers of climate change in a way that her “unsexy” work on methane gas – aka “swamp farts” – won’t achieve. Her plans are complicated by her boyfriend and Project Manager, Andrew (Jonathan Randell Silver) – who manages to be simultaneously dorky, dopey, and drippy – as well as her secret lover and assistant, Lincoln (Mike Smith Rivera), and her nervous co-conspirator and lab technician Maya (Shyko Amos). Goidel packs as many laughs into each line as she can, at times with great success, although the play verges on hamminess. Immediate changes from one scene to the next, achieved simply by a change in lighting focus while the pivotal character stays in place, produces some of the most successful comedic moments and gives the piece its necessary pace. It is gratifying to see a woman master-minding (mistress-minding?) the central scheme, and yet the environmental fanatic borders on a stereotype too easily taken up by those who wish to discredit the very real, very sane, and very well-informed scientists who are currently sounding the alarm regarding climate change. 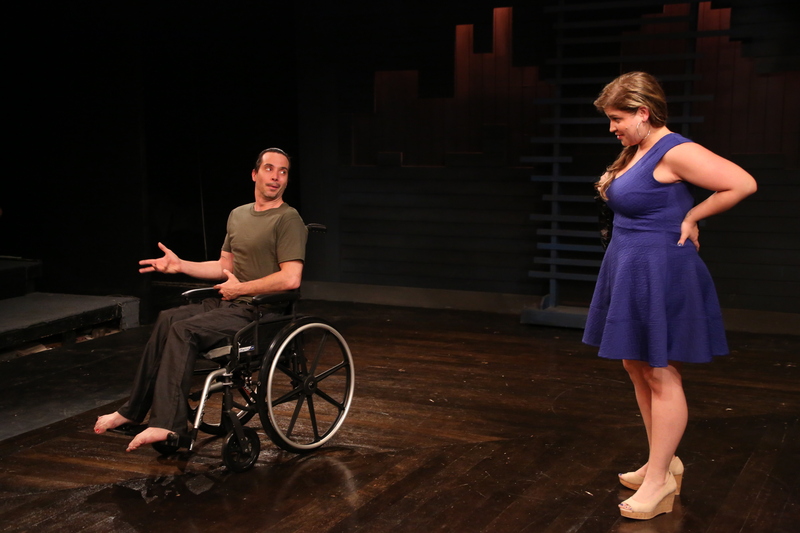 The play touches on important issues, but amidst the light humor they lose their resonance. They discuss judgment and correct terminology (Jess’s early faux-pas is to venture “differently abled” to John’s outright disgust). While Jess’s lack of social privilege is made clear through the dialogue we are, of course, visually confronted by her comparative physical privilege as she bathes and dresses John. Mozgala is excellent, and it is admirable that an actor who does have cerebral palsy is cast in the role. The relationship is ultimately key, and the two have real chemistry. Lázaro-Muñoz, in particular, almost steals the show in her pitch-perfect embodiment of the tough but warm Jess. The Hour of All Things by Caridad Svich, directed by William Carden, wears its political heart on its sleeve. Or rather, Svich, through the character of Nic (Miriam Silverman), investigates the emotionality of politics and the internal struggles of well-meaning, middle-class liberals, whose hurt at the injustices of the world is genuine, while their efforts to instigate change are often reduced to mere gestures, trapped within the system of which they are themselves a product. Nic does indeed speak for many and Svich in her lyrical, poetic and yet somehow still natural style denies the posturing of which liberals are often accused. The deft characterization of Nic (that comes through in the writing, costuming, and Silverman’s performance) as a woman who exudes normalcy, but – like all of us – has her own complex internal life and sensitivities, gives this piece a universal appeal. As an extended monologue, the play does seem very long and each of the seven “portraits” into which the play is divided could easily stand alone. Cora and Dave Are Getting Older by Julia Cho and directed by Marcia Jean Kurtz is another portrait of sorts and deals in a different – but equally relatable – form of anxiety. Cora (Dawn McGee) and Dave (Jack Sochet) are readying themselves for bed after dinner with their apparently faultless friends, Abby and Tim. To be fair, Dave is ready for bed – he is in bed – and most of the dialogue goes to Cora; Dave’s evident desire to just sleep establishes a nice little running gag throughout the piece. Cora’s near monologue as she praises her friends reveals – at first subtly and then to an almost absurd degree – her sense of inferiority by comparison. The tone later shifts as Cora speaks openly to the possibly sleeping Dave of her conviction that Abby and Tim are “better versions” of them, so “vastly superior” that they render them “redundant.” The play hinges on Cora and Dave’s relationship and again the chemistry between the two actors is en pointe. McGee and Sochet manage to lend their talkative and reticent characters real appeal and when Dave finally offers the gift of some picture-changing information and some simple, sincere words of reassurance, we share in Cora’s satisfaction and appreciate the warmth between the two. Mention should be made of the production team who succeed in capturing the setting, costuming, and mood of these disparate pieces; nor is the marathon slowed by any awkward or extended set changes. Undoubtedly a marathon for those involved in its production, for the audience EST’s Marathon of One Act Plays is more of a smorgasbord. These short plays, varied as they are, will not necessarily appeal to all, but it is an opportunity to hear from several playwrights – some more, some less experienced – but all talented. The production of so many short pieces in such a short season is doubtless slightly hurried, but the performances of the universally able actors, well supported by their directors, along with the work of the designers and production team, is an excellent demonstration of EST’s dedication to its mission. Directed by William Carden, Nick Leavens, Abigail Zealey Bess, Marcia Jean Kurtz.